Jews and Samaritans simply didn’t get along. The trouble went way back, five centuries or so, to the days of the Jewish leader Zerubbabel. Some Samaritans offered to help the Jews rebuild their temple, and Zerubbabel rebuffed them. The Samaritans responded by complaining to the king of Persia, and the work stopped (Ezra 4). Later, when the Jews were rebuilding the walls of Jerusalem, the governor of Samaria threatened to take military action against the Jews. The Samaritans eventually built their own temple on Mt. Gerizim, and in 128 B.C., the Jews destroyed it. Although their religions were both based on the laws of Moses, they were bitter enemies. But Jesus was not shackled by the squabbles of the past. Although most Jews avoided Samaria, Jesus walked right into it, taking his disciples with him. He was tired, so he sat down at a well near the city of Sychar, and sent his disciples into town to buy some groceries (John 4:38). 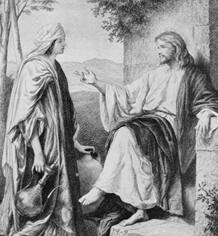 Along came a Samaritan woman, and Jesus talked to her. She was surprised that he would talk to a Samaritan; his disciples were surprised that he would talk to a woman (verses 9, 27). Jesus shows us a simple way of dealing with people who have different religious beliefs, people who are from a different ethnic group, people who are traditional enemies: just treat them like normal human beings. Don’t ignore them, don’t avoid them, don’t insult them. But Jesus had something much more profound than that to say. The Samaritan woman was surprised that a Jew would actually drink from a Samaritan water pot. He began in the simplest possible way: He asked the woman for a drink. He was thirsty, but he had nothing to draw water with — but she did. He had a need, she had a means of fulfilling it, so he asked her for help. She was surprised that a Jew would actually drink from a Samaritan water pot — most Jews considered such a vessel ritually unclean. And then Jesus said: I have something a lot better than water, if you want it. I am willing to ask you for a drink of water — are you willing to ask me for something that’s better? (verses 7-10). Jesus was using a play on words — the phrase “living water” usually meant moving water, flowing water. The woman knew quite well that the only water in Sychar was in that well, and there was no flowing water nearby. So she asked Jesus what he was talking about. He said he was talking about something that would lead to eternal life (verses 11-14). He was talking about religious ideas — but would the woman be willing to listen to spiritual truth from a religious enemy? Would she drink Jewish waters? The woman asked for the living water, and Jesus invited her to get her husband. He already knew that she didn’t have one, but he asked anyway — possibly to show that he had spiritual authority. He was the vessel from which she could receive the living water. The woman got the message: “I can see that you are a prophet” (verse 19). If Jesus knew the facts about her unusual marital status, then he probably knew spiritual truths, as well. After learning that Jesus was a prophet, the woman brought up the old controversy between Samaritans and Jews about the proper place to worship: We worship here, but you Jews say that people have to go to Jerusalem (verse 20). Jesus responded: The day will soon come when that won’t be relevant. It won’t matter whether people look to Mt. Gerizim or Jerusalem — or any other location. The hour is already here when people will worship God in spirit and truth (verses 2124). John 10: Which Voice Do You Hear? Has Jesus suddenly jumped to a different subject? Maybe not — the Gospel of John gives us some clues about what he meant: “The words I have spoken to you are spirit and they are life” (John 6:63). “I am the way and the truth and the life” (John 14:16). True worship means listening to the words of Jesus, and coming to God through him. Worship does not depend on place or time or ethnic group — it depends on our attitude to God as shown in our attitude to his Son, Jesus Christ. True worship comes along with the living water. Jesus was revealing a profound spiritual truth to this stranger — a truth just as profound as what he had discussed with one of Israel’s religious leaders (John 3). But the woman was not quite sure what to make of it, and she said, When the Messiah comes, he’ll tell us what’s right (verse 25). Jesus responded, I am he — probably his most direct claim to be the Messiah — and yes, what I am telling you is right. The woman left her water jar behind and went back to town to tell everyone about Jesus, and she convinced them to check it out for themselves, and many of them believed. They believed not just because of the woman’s testimony, but because they listened to Jesus himself (verses 39-41). Sometimes people today get too opinionated about worship — true worship has to involve a certain day of the week, a certain type of song, a certain posture or some other detail. But I think that Jesus’ answer to the Samaritan woman covers it well: The time will come when you will worship God neither this way nor that, because God is not to be found in earthly places, rotations of the earth, cultural music or human gestures. God is spirit, and our relationship with him is a spiritual one. We live in time and space, and we use time and space in our worship, but those details are not the meaning of worship. Rather, our worship centers in Jesus, and in our relationship with him. He is the source of living waters that we need for eternal life. We need to admit our thirst, and ask him for a drink. Or to use metaphors from the book of Revelation, we need to admit that we are poor, blind and naked, and ask Jesus for spiritual wealth, sight and clothing. We worship in spirit and truth when we look to him for what we need. In marriage, different people express love in different ways, and some forms of expression are appropriate in public, and some are not. This is true of worship, too. We express our adoration in different ways, and some ways are more appropriate in private than in public. Certain activities, though they may seem worshipful to one person, may appear disrespectful or distracting to another person. When we worship together, we do not want our activities to put other people off. At the same time, believers who are more formal need to be tolerant of a little diversity. True worship is not defined by external matters, but by our attitude toward Jesus Christ. When it comes to worship, though there will always be room for improvement and maturity, may we continue to learn from Jesus not only about what worship really is, but also the way we interact with people who think about it differently than we do.